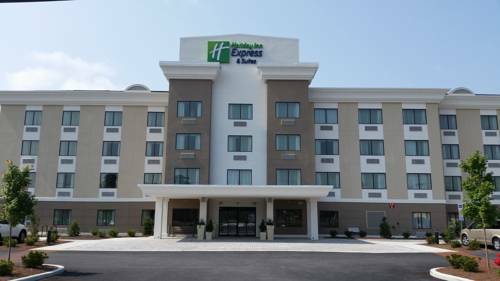 Located just minutes from Downtown Ocean City Maryland and the famous Ocean City Boardwalk you will find our beautiful brand new property the Holiday Inn Express & Suites. We offer plenty of amenities for our travelers, that is, if they can pull themselves away from the dozens of attractions available nearby. The hotel is located a few miles from The Roland E. Powell Convention Center and also offers complimentary high-speed, wireless Internet access makes it easy to stay in touch with the office, while free local calls help you stay in contact with nearby clients. If you're here for pleasure, you are just minutes away from the outstanding shopping at Tanger Outlets, dining, entertainment, and all the adventures that Ocean City has in store! Adventures can be found around every corner here and we definitely recommend a relaxing day trip to Assateague Island National Seashore to see the beautiful wild ponies or plan an exciting adventure at Trimpers Amusements where carnival rides and games await to delight people of all ages and sizes! Come stay with us in Ocean City, Maryland, where our hotel guests enjoy such conveniences as the complimentary, hot Express Start Breakfast Bar every morning. We even offer an indoor pool. Let us not forget to mention comfort - with luxurious bedding, modern decor and all the cable, sports and movie channels you'll need. Book your reservation by calling us today! It's an adventure of fun for the entire family! Children's program - Baja Amusements provides Miniature Golf and Go Karts in season for your children to enjoy on your trip to Ocean City, MD. Located 3 miles away from Ocean City near the town of Berlin, the Eagle's Landing Golf Course is one of the few best golf services in the region. Nestled amidst beautiful trees, lawns and ponds is the Pine Shore Golf that is haven for all golf enthusiasts. This 27-hole golf course is a family business that started in the 1970's and today is amongst the popular golf spaces in the city. The River Run Golf Club might be just one of the several golf courses and clubs in this wonderful resort town, but that does not take away the popularity of the place. 18-Hole course that is landscaped to perfection with gardens and sand dunes. The Beach Club Golf Links is an avid golfer's dream come true. It is the longest course in the Ocean City area, spanning across 7,020 yards of well manicured space. Rum Pointe Seaside Golf Links is one of the most famous golf courses in Maryland. Located in Berlin, this 18-hole course is quite challenting to say the least. The facililties available here are of high quality. Shop the many many stores of the Tanger Outlet. For store directory and map, please visit www.tangeroutlet.com/ocean city. Enjoy all the sights and sounds of one of the top Boardwalks in the United States. ~75 miles from Ocean City.